In my high school biology class, we worked in groups to complete experiments about once every two weeks. For each of these labs, we had to write a lab report. By my calculations, that means I completed about 20 lab reports that year. What do I remember about high school biology? The way that frog smelled. That’s about it. That same year, I took a civics class where we had to write a paper on the 1996 presidential race. In addition to my report, I made a short video, using news clips and the CCR song “Fortunate Son.” Fourteen years later, I can still picture the exact clips from that film. I think most of us have experiences like this – our most distinct memories of learning have to do with projects that caused us to think differently, creatively, and using various parts of our brains. Recently, I was talking with a group of high school science teachers about lab reports. Students hate them, and teachers hate to grade them. But they’re necessary, especially when preparing students for college expectations. I started thinking about the Discovery Channel television show Mythbusters. Now, I’m a science geek, so I love this show. But what’s striking is, so does pretty much everyone who sees it. Next time you’re at a party in America, just mention the show. I’ll bet that pretty much everyone present starts excitedly summarizing their favorite episode. Even my 10-year-old nephew can describe how the science of trajectories influences the path of a bullet. But any science teacher worth a salt will tell you that Mythbusters is nothing special. It’s just a basic lab report – they ask a question, do some research, design an experiment, test the question, and report on the results. So why do millions of people watch Mythbusters while I’m the only one who reads my students’ lab reports (and sometimes, to be honest, even I can’t get through them)? Okay, the Mythbusters blow stuff up a lot, and they’ve got a pretty big budget. But I’d argue that the only real difference between one of their episodes and a student lab report is their ability to communicate their ideas compellingly. Basically, they make it interesting. As teachers, that’s what we’re always trying to do. And we science teachers are often pretty good at it – demonstrating an explosive chemical reaction, a watch that runs on a potato, a Coke-powered Mentos rocket. Yet we rarely give our students the opportunity to create compelling reports. In the 21st century, the ability to communicate effectively is a skill all our students will need. They live a world with more people than have ever existed on this planet before. If their voice is going to be heard, they’ve got to make it interesting. And we’ve got to help them. So why not start with one of the least compelling tasks in school that exists in one of its most exciting subjects? Why not have our students create Mythbuster-like lab reports? Done well, these reports could gain interest on YouTube, help us teach future students, or even win competitions, like this semi-finalist from the PBS Wired video contest. So how can teachers, with limited time and equipment, expect students to be Mythbusters? There are a lot of options — you just have to find one that works for you. When I was teaching, we had a class set of Macbooks. My students used the built-in Web cameras to record and iMovie to edit. Although we spent a lot of class time on filming and editing, it worked within my schedule and my learning objectives (most of my students were English language learners, so the verbal practice they were getting was integral). However, I realize that there are a lot of teachers who don’t have much hardware or time for video projects. Below are some low-cost, as well as FREE, options available to you. Flip cameras are easy-to-use, inexpensive tools for video-making. You can get them for as little as $150 each, and there are grants available that can help you buy a class set. With these cameras, you could have students record their videos in class or for homework. If students are creating a video as part of a traditional lab report, I’d suggest having them record their in-class experiment and then record supplemental scenes at home. If your students have computers at home, they could even do all the editing for homework (Flip cameras come with built-in editing software that works on PCs and Macs). Most of the students I’ve worked with, though, didn’t have access to computers outside of school, so some teachers might dedicate a class period to editing the videos. Ideally, students should do all their planning and storyboarding for homework. If they record their in-class experiment and complete all their supplemental recording at home, they’d only need a limited amount of time to throw everything together inside of class. One teacher I work with has her Watsonville High School students complete reports on genetics every year. In the past, the project consisted of a poster and a verbal presentation. But this year, Burnne Yew gave her students the option of using Flip cameras to create video reports. Below is one of the completed videos. There wasn’t an experiment to do, so Ms. Yew sent a Flip camera home with these students. They did all their recording for homework and, using the built-in Flip software, edited this project together in less than an hour of class time. If you’re looking for a tool that you can use for more than just film-making, you might consider buying netbooks with built-in webcams and an Ubuntu operating system. Students could use free video editing software, like OpenShot, for this project, and the netbooks could be used for a variety of other lessons and subjects. Some high-quality netbooks are as cheap as $300 each, so it’s possible to go one-to-one and send them home with students. There’s a lot more information on this option on my blog post One Laptop for Every Student Finally an Affordable Option. If you don’t have the means to buy video hardware, don’t worry. There are several FREE Web tools that allow students to create cartoons quickly and easily. With xtranormal, students can simply type up a script and choose two pre-made characters to read it. They can also choose from a list of motions for the characters to perform during the film. This is a bit limiting, especially if you want videos to include some re-enactment of an experiment you completed in class, but it’s possible to create a really engaging film. Go!Animate is another FREE Web-based tool where users can create their own cartoons. Go!Animate has a lot more functions compared to xtranormal, so students can customize their characters, record their own voices, and include talk bubbles. Although additional customization can take more time, it’s definitely a strong option. If you have younger students, DomoAnimate is a more child-friendly version of the site. These Web-based options are perfect for teachers who don’t want to give up any class time. Most students (especially in upper grades) can be expected to use these tools for homework, if your students have Internet access at home or through local libraries. But you can also have students complete the videos in a single class period. If you want to get more in-depth with video creation, though, you might want to check out this lesson plan and rubric from Left Foot Right Foot Technology. When science teachers hear about video lab reports, a lot of them respond negatively. One of the main points of lab reports, after all, is to prepare students for the work they’ll have to do in college and, if they become scientists, their professional lives. I totally agree. The world is changing, and how we present and consume information is changing along with it. So it’s important that our students know how to present their knowledge in a multi-media context. However, that doesn’t mean they shouldn’t learn to write a lab report. Give your students the choice to do a video, glogster, or written report, and require they do at least 3 written and at least 3 multi-media reports in the course of the semester. Have students complete several written reports at the start of the school year and, once most students are writing high-quality reports, start assigning video lab reports. 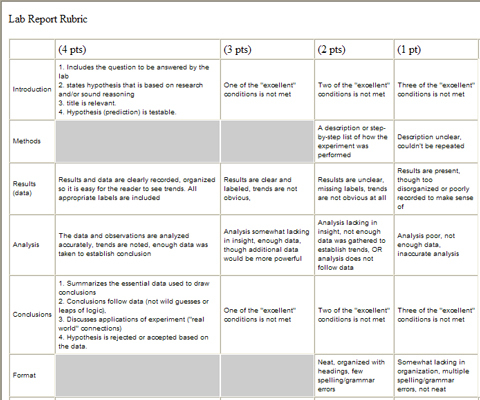 Have students complete a written report and use it as the plan for their video lab report. Both the written plan and the video could be turned in for a grade. Objective: The student will be able to observe and explain that different materials have different properties. Kindergarten teachers are masters at recruiting helpers from upper grades. Several of my fourth-graders used to regularly give up their recess to read to their younger peers. So why not use this partnership for technology projects? I once partnered fifth-graders with first-graders for podcast creation, and it worked great. This is one way to integrate film-making into lower elementary classes. It’s important to introduce students to technology tools early and give them the opportunity to try to create videos. However, many of them (especially those in Kinder and first grade) will need hand-holding. Teachers rarely have the time, but partnering with an upper elementary class could be the perfect solution. Perhaps a fifth-grade teacher at the same school would be willing to bring an entire class in for an hour. Or you could just have older students volunteer during recess, and rotate your younger kids through a “video center,” where older students are in charge. Using your science content, write out instructions for an experiment and a list of questions for the older students to use. Have them partner with younger kids individually or in small groups. The older students then read the questions to the younger kids and record their responses. The students work together to edit a short video showing what the younger kids did and learned. Teachers can use these videos later in the year, to see if students’ conclusions change after watching just the experiment. They can also show the videos to parents to explain what and how students are learning in science.